From perfecting your holiday look to giving the gifts every girl-friend will remember, The SEPHORA COLLECTION has all the essentials you need this holiday season. From their all-in-one palettes to their skincare line and accessories you're sure to find insta-worthy gifts for all your friends and family. I'm loving what Sephora has in store for the holidays. Their color line-up is always beautiful and their gift sets are every girls dream come true. They have gifts for all budgets and for all beauty needs. Just check out the products they sent me for the holidays! Sephora Collection Wonderful Stars Palette ($18) – Enhance your makeup with just one product that you can take anywhere! This face and eye palette includes 9 matte and shimmering eyeshadows, 9 blushes and a luminizer to create the perfect glowing holiday look. 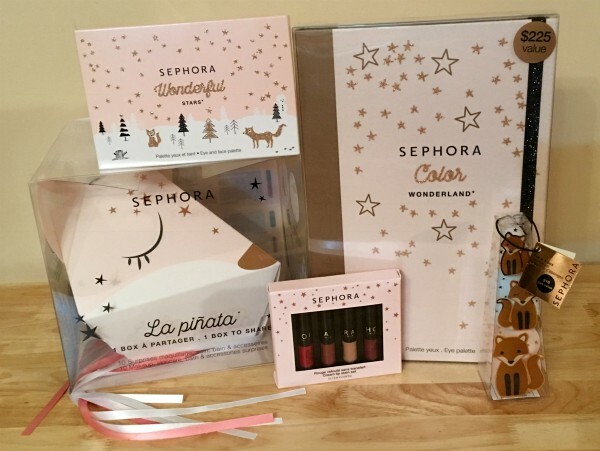 Sephora Collection La Piñata ($30) – Who hasn't dreamed of organizing a beauty party where you can win prizes including makeup, skin care, bath products and beauty accessories! This piñata contains 10 beauty gifts everyone can share to add a touch of magic to your holiday festivities. 3. One tug and the piñata opens to reveal all its gifts! Sephora Collection Color Wonderland Eye Palette ($59) – A luxurious palette to help you create every look you can dream of from trendy to sophisticated. This collection of 78 eyeshadows and 2 eye pencils will allow for a custom look for every event. Sephora Collection Mini Cream Lip Stain Set ($12) – Sephora's best-selling Cream Lip Stain in a limited-edition set featuring 4 must-have shades. Precise applicator hugs lips for the ultimate precision and the light-weight, long-wearing matte formula keeps color comfortably in place with nourishing avocado oil. Sephora Collection Fox Sponge Trio ($18) – The cutest sponges you’ve ever seen, this fox trio makes applying makeup a little more fun. With three varying sizes, this set has everything you need to apply all of your makeup to every part of your face.